Ron Zank has been involved with the Great Plains Theatre Conference since the beginning, directing readings, acting, reading script submissions, responding to plays, and moderating lunchtime panels. An Assistant Professor of Theatre at the University of Nebraska at Omaha, he teaches Theatre History and Dramatic Literature, as well as Introduction to Theatre and Script Analysis. 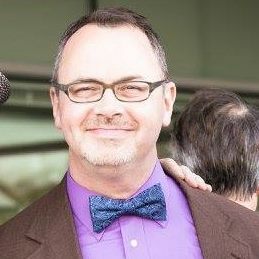 Locally, he has directed for the Shelterbelt Theatre, Chanticleer Community Theatre, the Dundee Dinner Theatre, and the Bluebarn Theatre. This spring he directed the first full production of Colonel’s Chicken: A Fairy Tale, by Carrie Barrett (Playlab play in 2017.) In November he will stage Sarah Ruhl’s adaptation of Virginia Woolf’s Orlando. His research focuses on stage musicals adapted from films.